Creating the Artful Home: The Aesthetic Movement is a richly-illustrated history of an aspect of Victorian design known as the Aesthetic movement, as it unfolded in American homes. Creating the Artful Home: The Aesthetic Movement is the first in-depth look at late 19th-century home design and its cultural context. Average housewives transformed the radical premise of the Aesthetic Movement — art for art’s sake — into lush, nurturing homes. They believed that artful homes made people better, families happier, and society stronger. An artistic home was a moral imperative. As it flowered in America, the Aesthetic movement became not so much a style as a process. The Aesthetic Movement left us a legacy of Queen Anne houses and tidy suburbs, and its influence is now felt as Americans embrace the more-is-more philosophy of home furnishings. The Aesthetic movement grew out of ideas and the products of English reformers, such as William Morris, and was flamboyantly promoted by Oscar Wilde in an 1882 lecture tour across America. The movement germinated among artists who used opulent color, decorative patterning, and lavish materials simply for the aesthetic effects they could evoke. Tastemakers rallied—Louis Comfort Tiffany became an interior designer while his father’s firm, Tiffany and Company, produced Japoniste silver. Eastlake furniture invaded fashionable shops like Cottier’s, and Oriental stores appeared in even small towns. Graphics transmitted the new design overtly through advertising and subtly through products like ubiquitous Staffordshire tableware. Creating the Artful Home takes a thorough look at household furnishings of the Aesthetic era. Dozens of never-before-published illustrations, including rare color views of 1880s interiors and exteriors, shed new light on American homes. The Maximalist products and décor of the 21st century are examined in sidebars. The book gives modern homeowners insights into how American houses of the past have shaped our houses today – and how we might create our own artful homes in the future. 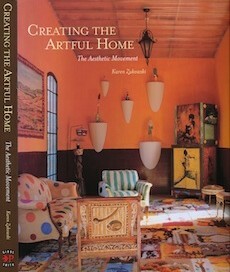 See what critics are saying about Creating the Artful Home! Be sure to order today and receive a signed copy from the author! Karen, I’m excited to receive the book which I just ordered. I love the Aesthetic movement (lived for a time on Chiswick Mall in London on the other end of this lovely promenade on the Thames from William Morris’s house). I’m reading a galley of an historical novel called THE VIRGIN CURE by Ami McKay (available in stores end of June) about life among the haves and have-nots in 19th century NYC. It paints a vivid picture of life in the slums, in the upper-middle-class houses, and in the bordellos. Thanks for the nice post. I hope my book will make the case that the Aesthetic Movement in America was just as compelling as it was in Britain. The Virgin Cure sounds wonderful — just my ticket!